Karelia house of payer construction update. Youth Conference, Palm Coast, Florida. September 8, 2018. Saturday, 10am. Пожалуйста, молитесь о конференции, чтобы Господь исполнил силы проповедующих и прославился в жизни слушающих. Ждем вас и молодежь, с участием, на конференцию. Да прославится Господь в вашей жизни! 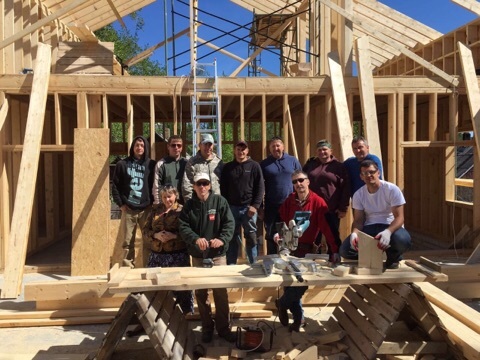 Construction team - volunteers from USA, Russia, Belarus, and locals Christians. "Тайна успеха, Испытания и благословения Иосифа"
This sermon by Mark Cahill entitled Watchmen, was recorded at Slavic Baptist Church of Palm Coast on September fourteenth of two thousand and thirteen. Please feel free to make copies of this message but do not charge for these copies or alter their content in any way without express written permission. May God work in your heart through the holy spirit as you listen to this recording, and enable you to live-out the biblical truths in this message. Приглашаются действующие миссионерские группы, а также все желающие трудиться на миссионерском поле. ===> Click here to register for the Missionary camp! Собрать активных миссионеров, работающих в различных регионах, для ободрения и вдохновения их в миссионерской деятельности. Обмен опытом миссионерской работы в неформальной обстановке. Greetings dear brothers and sisters in Christ! I am glad to write you again about the mission in Karelia. March 6-8, my trip to Kiev went smoothly. I was glad to participate as a speaker at the conference. I spoke on the idea of “practical outreach”. Out of the 400 people attending, 60 expressed an interest in the missions work in Karelia. The seminar went well and the youth genuinely enjoyed being there. I was also able to share my personal testimony. At the end of May, I am tasked with getting the groups ready that will participate in short-term missions work in Karelia. Please pray for these efforts and for God’s blessing in doing His work. We had looked into obtaining an old church building formerly belonging to a Lutheran group. We have found that we won’t be able to purchase the property and have ceased efforts to do so. 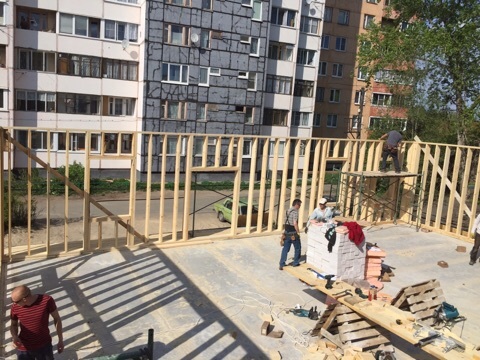 I am grateful that God has shown us this and am praying that He will aid us in getting a place of our own in the future where we can have a home base for the church in Petrozavodsk as well as the mission. The lack of a dedicated building to hold Sunday services poses some problems for us. Currently, we meet in my home, but as more and more people join the church we quickly run out of space. I have met with brother Julian Erinchuk to discuss with him the possibility of organizing another at-home church in his residence. Brother Julian participated in missions work in Karelia prior to my arrival here and promised to think about my proposal. If God moves him to aid us in this problem, we could split the church up into two smaller groups and hold Sunday services more comfortably. Below is an updated chart of the small groups in our church. We have two new groups, the “post-rehab” group and the “new believer” group. The rehab group is aimed to evangelize to those suffering from alcohol and drug addiction in Petrozavodsk and the surrounding area. They are also tasked with admitting those in need of serious help to the center as well as helping integrate post-rehab patients into society. These brothers work in lumber yards and in construction. All of the outreach and help they do is funded out of their own pockets and with help from donations. The group for new believers was created for those who have just recently come to know Christ and who are in need of the most support and care throughout their spiritual journey. We currently have three people in this group. Please pray for their spiritual growth. From May 1 through the 3, we plan to organize a family-oriented conference as a part of a trip outside the city. For this, we rented a small cabin and invited guests from St. Petersburg. Attending this conference will be both the non-believer and new-believer husbands of many of our female members. I hope that everything will go smoothly and without conflict and that we can bring these families closer together through the power of God’s word. In the last letter, I wrote about the unfortunate accident with brother Constantine. His leg has healed and everything is okay. We have sent him on a small vacation to St. Petersburg to recover fully and brother Sergey has taken his place as the leader in the rehab center. May God bless his work! We also have some new problems here. The vehicle dedicated for use in the rehab center has broken down. It won’t start and we cannot figure out the cause. We have been using it heavily this winter and it seems like it just couldn’t handle the stress… Russian cars aren’t built for Russian roads. Our brothers in the rehab center have also been praying for an opportunity to build a new building from logs or better wood. This winter we had many very cold days and nights and the floor reached temperatures of -1 degrees Celsius (30 degrees Fahrenheit). The walls of our building are only 4 inches thick and the wind blows through them. We have put some effort into insulating the building, but it doesn’t help much. You can’t keep putting new patches on old clothes, so we have decided that a new building is the best way to go in this situation. We have reached a new milestone in this outreach effort. 12 kids have shown themselves to be very active and ready to be leaders in this mission. For them we have prepared a course of 7 steps to get them ready to take up leadership positions among their peers. During the summer camps, we will help them develop the skills necessary by putting them in positions as helpers to the leaders. They are eagerly awaiting summer and the arrival of the youth missionaries from Florida who they met during the mission trip two years ago. We also held the first training/hiking trip with our youth. We are also planning on a tougher trip from May 9 through the 11. We do these outings in order to help the youth grow closer together and of course to relax and have a good time. One of the goals of these trips is to invite youth that isn’t saved and through a positive influence bring them closer to Christ and their salvation. We are a little short on camping gear, but with God’s help this problem will get taken care of. Karelia is a perfect place to go camping, hiking, and to witness the glory of God’s creation. In the summer from June 20 through July 20, we plan to organize summer children’s day camps in the Sortavalskiy region and in Meleorativniy. Even now, we ask you to begin praying for this work as we prepare physically and spiritually. Please pray for the support of the local administration and for support from the Baptist churches throughout the neighboring counties. We can use all the manpower we can get. One of the Lutheran churches where we were planning to hold a day camp suffered a fire, so we are looking for another place where we can do so. Please pray for them and us in this issue. Thank you for all your support and prayers! May God bless you!